Dubai: The title ‘Thala’ (head) by his Chennai Super Kings fans fits Mahendra Singh Dhoni perfectly, as he has time and again proved by using his head to catch his rivals napping. The Indian stumper made James Neesham think that the ball has ricocheted off his pads far from the crease on Sunday. 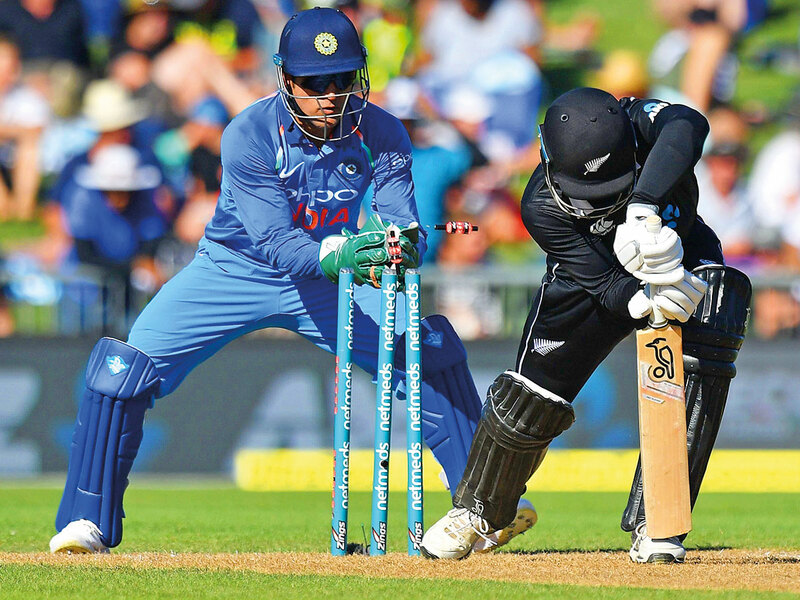 When the New Zealander took off for a non-existing single, only to be sent back, he was far short of his crease when Dhoni casually dislodged the bails with a throw en route to India’s victory in the fifth and final One Day International at Wellington. Needless to say, within minutes the tweet went viral. Dhoni, whose presence in the team was being questioned only a month ago, has often used his street cricket skills to give vital breakthroughs to the Men in Blue. He uses his head as much as his quick reflexes, be it in batting or keeping. His performance with the bat in the recent ODI series against Australia and New Zealand, meanwhile, propelled him three places higher to 17th in latest ICC ODI rankings. If the veteran stumper’s dismissal is fresh in memory, how can one forget the lighting stumping to get rid of Ross Taylor in the second one-dayer, when the New Zealander was off balance and lifted his foot off the crease only for a split second to be sent back to the pavilion. There are many more such instances where Dhoni has adopted non-conventional techniques to gain the upper hand. In the 2016 World Cup Twenty20 group game, Dhoni dashed the hopes of Bangladesh with a smart run out off the last ball at the Chinnaswamy Stadium in Bengaluru. With Bangladesh needing two runs to win off the last ball, Dhoni removed one glove to ensure that he could throw at the stumps with accuracy. Once the batsman missed the ball and started to run, Dhoni, instead of aiming at the stumps, ran faster than Mustafizur Rahman to run him out and give India a one-run victory. So beware, big brother Dhoni is watching you closely!